The event returns to its traditional Parliament Hill home after the National being contested at this famous venue last year meant a rare excursion to Brighton. Should he run, Richard Goodman, winner here in 2014, will be favourite, having shown improving form at Liverpool, the Europeans and Edinburgh. Defending champion Ben Tickner hasn’t raced since August and many think John Gilbert, who heads a strong Kent AC squad, could be a factor. Jonny Hay beat Goodman at Liverpool and will be contesting his first 15km race. Bedford won the team event last year from Belgrave and Highgate and those three teams again should be strong along with Tonbridge and Kent AC. the 8km muddy slog around Parliament Hill. In 2013 Lily Partridge won narrowly from Steph Twell and Aldershot dominated but these two aren’t entered and last year they failed to finish a team as Winchester won from Belgrave. Abel Tsegay is young enough to defend his junior title but will be up against under-17 winner Mahamed Mahamed. Last year’s under-20 women’s champion Amy Griffiths is also eligible to defend but won’t be favourite if 2014 champion Bobby Clay starts. The Notts AC trio of Alastair Watson, Aaron Scott and Samuel Mitchell will be looking to repeat their dominance in the senior men’s race. In the senior women’s race, Charnwood’s Jane Potter and Bournville Harrier Nicola Sykes will resume their battle, while Oswestry’s Alison Lavender will be looking to break into the medals this year. The under-20 men’s race looks to be wide-open, with most of last year’s main players moving up, so 2015’s under-17 winner, William Richardson from Birchfield Harriers, may be the one to watch. Mansfield’s Ella Hughes, who finished third in the under-20 women’s race in 2015, could go better this year with her main rivals having changed to the senior ranks. Success has come late in Andrew Davies’ career but he is determined to enjoy it. That’s why the 36-year-old Stockport Harrier is out to defend the Northern senior men’s title he won at the expense of Olympic triathlon gold medallist, Alistair Brownlee, at Pontefract 12 months ago. 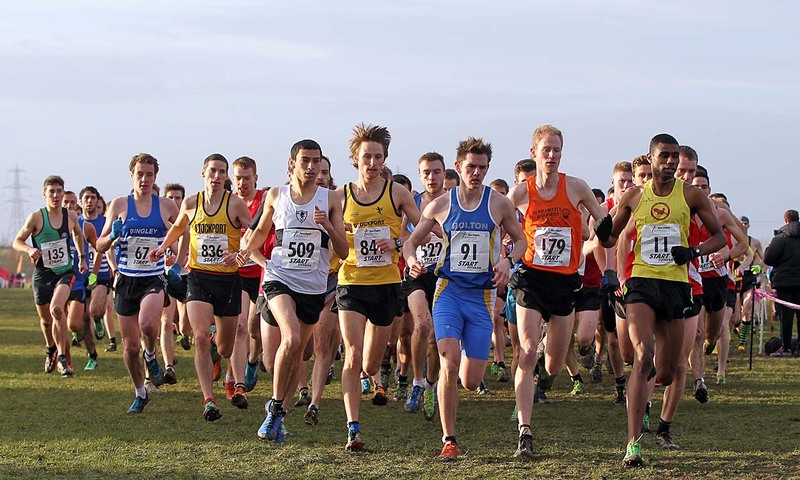 Leeds City AC’s Simon Deakin won the Lancashire title and is among the Yorkshire club’s Northern entry list. Brownlee and brother Jonny are included in Bingley Harriers’ squad names. There may be a new name on the senior women’s roll of honour as holder Elle Vernon of Stockport Harriers won’t defend after her exertions at the Cardiff Cross Challenge in Bute Park. Leeds City’s Claire Duck, who edged Susan Partridge into second spot at the Yorkshire Championships, could profit. She was eighth on her England debut at Antrim earlier this month. Rebecca Robinson was bronze medallist behind Vernon and Emma Clayton 12 months ago.